It’s been almost a week since Kanye West did Kanye West things, pretending to interrupt Beck’s acceptance of the 2015 Grammy for Best Album, and then making some comments afterward critical of the Grammys and its respect of “artistry”. People flipped out, and many a Facebook feed has been filled with commentary, memes, or the lead singer of Garbage’s take on the whole thing. There’s also been a willful misinterpretation of the comments, as though the comparison was between Beck and Beyonce personally, rather than the content of the albums. So, to be absolutely clear, no one actually involved in this is upset. The Grammys are happy they seem relevant, more people are checking out both albums than would otherwise be the case, and Beck and Kanye seem to like one another. The only people getting upset are the ones it doesn’t really effect but want to take umbrage anyway. That is the irony of our lives, having to care because we will never be as good at any one thing as someone like Kanye West is at several. His life is dope and he does dope stuff. That said, the point of Kanye’s criticism seemed to be related to the relationship between race and industry recognition. [Actually, his clarifications on this point say that’s inaccurate, so the peg to this article isn’t valid and it’s too late to come up with another one] The son of a Black Panther member and of a Chicago university professor tends to view a lot of aspects of American life through the lens of race, and the dude is so confident in himself and his gifts that decorum is subservient to his sense of justice in these things. We can acknowledge that in the past, black Americans’ contributions to art and culture were ignored or passed over due to racism, or waiting for a palatable white artist to do the same thing. I don’t think that’s in dispute. What we would argue about is when that stopped happening, or whether progress can be turned back and go the other way. There are a lot of Grammys, but like golf or tennis, not all wins count equally. The four Grammy “majors” are the general awards: New Artist, Song, Record, and Album of the Year. That’s not entirely arbitrary, because Grammy nomination and voting is set up to be more specialized for the minor awards, while the general awards involve everyone, even when it’s not a voter’s area of expertise. Vocative.com already did a good article about this, and broke it down some more, but they inexplicably left out the final and most relevant bit: who actually wins. Below, I’ll talk some more about possible differences between my data and what theirs would have been*, but largely all three agree with one another. 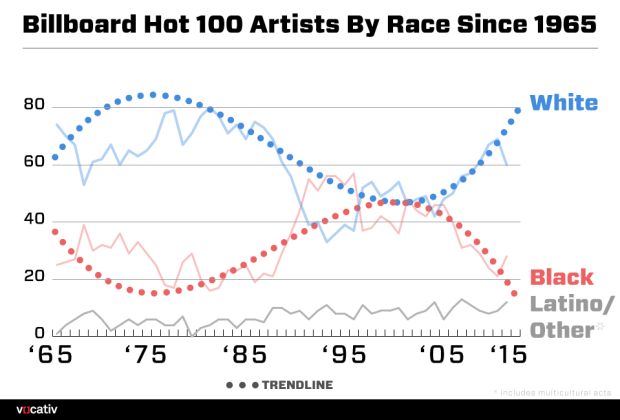 Black artists had much lower representation in music in the ’60s and ’70s, much more in ’80s and early ’90s, but in the present day, that influence has waned. No black artist has won a major Grammy since 2010, when Kanye didn’t need to let anyone finish because Beyonce won Song of the Year for “Single Ladies,” but the stark decline goes back to at least 2005. 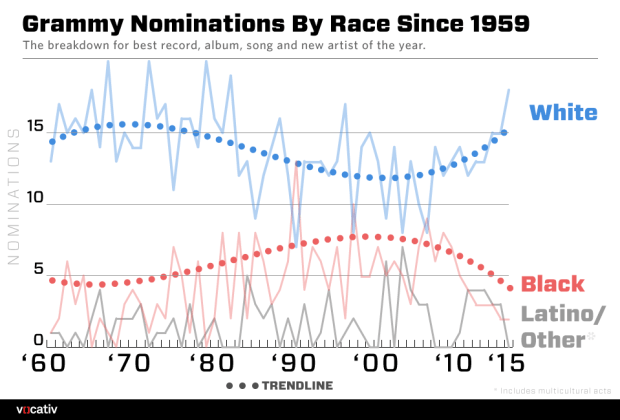 Perhaps most interesting about this is that the gap in chart success only begins in the past 10 years while in terms of Grammy nominations and wins, the diversion has been going on for the past 20. But black Americans make up about 13 percent of the U.S. population, so looking at the past 15 years only, it actually looks right on: 8 out of 60. On this point I’d point out the oversized contribution to popular music that black Americans have made, essentially as long as we’ve had popular music but especially in the past 50 years. Latino and Asians make up a larger portion of the U.S. population than black Americans, but blues, jazz, a lot of folk, rock and roll, soul, gospel, funk, R&B, and hip hop are all products of black Americans, and they and their genre progeny continue to be extremely popular. Salsa and J-pop have never captured the U.S. imagination in the same way, and hopefully that doesn’t come across as overly dismissive. What is the right ratio? I don’t know. I don’t have a great number for it. But it’s interesting that it’s not just the Grammys but the Oscars, too. And it’s not just subjective awards, but the wealth disparity. I don’t have a compelling reason why you should believe those things are related, though. *I don’t know exactly how they went about sorting their data, and there possibly would be some discrepancies if they had made one for winners instead of me. I had intended to consider both the performer and producer of Record of the Year, but that got complicated, and by 1999, there were too many moving pieces to make sense of. The shape doesn’t alter much considering only performers for that, but the Other portion of “Latino/Other” jumps from 4 to 16, taking equally from “white” and black.” Even regarding performers only, in cases of various artists being involved in a project controlled by a single producer or composer, I went off of that person, but in 2002, the movie soundtrack “O Brother Where Art Thou?” with a mixture of original and traditional song performed by a mixture of people; that became “other”. In 1979, the Bee Gees were the main artists on the Saturday Night Fever soundtrack, so I counted them toward the “white” totals. I counted Fun with Janelle Monáe as “Other” because they seemed to have equal contributions to their song of the year “We Are Young” while considering the Doobie Brothers and Toto “white” overall. I counted Christina Aguilera as “white” and Esperanza Spalding as “Latino/Other” based on my own perceptions and what I could find of their self- identification. Finally, in 1967, there was no Best New Artist, so that year had only three total awards; for 1990, I decided to include the decision to give the award to Milli Vanilli without concern to it being vacated. Altogether, that’s not revelatory or likely interesting, but the point is that there are a lot of subjective decisions that could nudge the results slightly in a different direction. For the most part, they cancel one another out. Race, like racism, is a social construct.